But among the politicians of Italy in the first century B.C. there were no maps of Germany and Russia, Africa and Central Asia, and no sufficient intelligence to study them had they existed. Rome never developed the fine curiosities that sent Hanno and the sailors of Pharaoh Necho down the coasts of Africa. When, in the first century B.C., the emissaries of the Han dynasty reached the eastern shores of the Caspian Sea, they found only stories of a civilization that had receded. The memory of Alexander still lived in these lands, but of Rome men only knew that Pompey had come to the western shores of the Caspian and gone away again, and that Crassus had been destroyed. Rome was pre-occupied at home. What mental energy remained over in the Roman citizen from the attempt to grow personally rich, and keep personally safe was intent upon the stratagems and strokes and counter-strokes of the various adventurers who were now manifestly grappling for the supreme power. It is the custom of historians to treat these struggles with extreme respect. In particular the figure of Julius Caesar is set up as if it were a star of supreme brightness and importance in the history of mankind. Yet a dispassionate consideration of the known facts fails altogether to justify this demigod theory of Caesar. Not even that precipitate wrecker of splendid possibilities, Alexander the Great, has been so magnified and dressed up for the admiration of careless and uncritical readers. There is a type of scholar who, to be plain, sits and invents marvellous world policies for the more conspicuous figures in history with the merest scraps of justification or with no justification at all. We are told that Alexander planned the conquest of Carthage and Rome and the complete subjugation of India and that only his death shattered these schemes. What we know for certain is that he conquered the Persian Empire, and never went far beyond its boundaries; and that when he was supposed to be making these vast and noble plans, he was in fact indulging in such monstrous antics as his mourning for his favourite Hephaestion, and as his main occupation he was drinking himself to death. 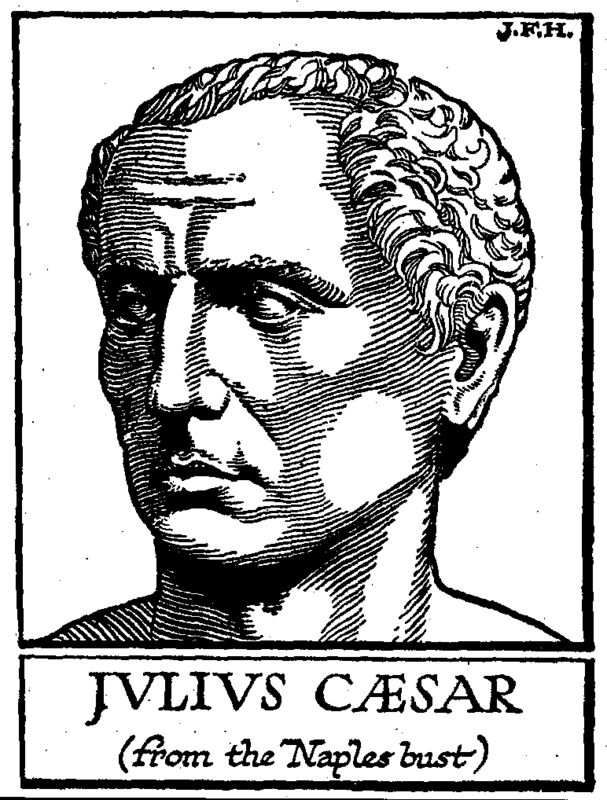 So, too, Julius Caesar is credited with the intention of doing just that one not impossible thing which would have secured the Roman Empire from its ultimate collapse–namely, the systematic conquest and civilization of Europe as far as the Baltic and the Dnieper. He was to have marched upon Germany, says Plutarch, through Parthia and Scythia, round the north of the Caspian and Black Seas. Yet the fact we have to reconcile with this wise and magnificent project is that at the crest of his power, Caesar, already a bald, middle-aged man, past the graces and hot impulses of youthful love, spent the better part of a year in Egypt, feasting and entertaining himself in amorous pleasantries with the Egyptian queen, Cleopatra. And afterwards he brought her with him to Rome, where her influence over him was bitterly resented. Such complications with a woman mark the elderly sensualist or sentimentalist– he was fifty-four at the commencement of the affaire– rather than the master-ruler of men. On the side of the superman idea of Caesar, we have to count a bust in the Naples Museum. It represents a fine and intellectual face, very noble in its expression, and we can couple with that the story that his head, even at, birth, was unusually large and finely formed. But there is really no satisfying evidence that this well-known bust does represent Caesar, and it is hard to reconcile its austere serenity with the reputation for violent impulse and disorderliness that clung to him. Other busts of a quite different man are also, with more probability, ascribed to him. There can be little doubt that he was a dissolute, and extravagant young man–the scandals cluster thick about his sojourn in Bithynia, whither he fled from Sulla; he was the associate of the reprobate Clodius and the conspirator Catiline, and there is nothing in his political career to suggest any aim higher or remoter than his own advancement to power, and all the personal glory and indulgence that power makes possible. We will not attempt to tell here of the turns and devices of his career. Although he was of an old patrician family, he came into politics as the brilliant darling of the people. He spent great sums and incurred heavy debts to provide public festivals on the most lavish scale. He opposed the tradition of Sulla, and cherished the memory of Marius, who was his uncle by marriage. For a time he worked in conjunction with Crassus and Pompey, but after the death of Crassus he and Pompey came into conflict. By 49 B.C. he and Pompey, with their legions, he from the west and Pompey from the east, were fighting openly for predominance in the Roman state. He had broken the law by bringing his legions across the Rubicon, which was the boundary between his command and Italy proper. At the battle of Pharsalos in Thessaly (48 B.C. ), Pompey was routed, and, fleeing to Egypt, was murdered, leaving Caesar more master of the Roman world than ever Sulla had been. He was then created dictator for ten years in 46 B.C., and early in 45 B.C. he was made dictator for life. This was monarchy; if not hereditary monarchy, it was at least electoral life monarchy. It was unlimited opportunity to do his best for the world. And by the spirit and quality of his use of this dictatorial power during these four years we are bound to judge him. A certain reorganization of local administration he effected, and he seems to have taken up what was a fairly obvious necessity of the times, a project for the restoration of the two murdered seaports of Corinth and Carthage, whose destruction had wrecked the sea-life of the Mediterranean. But much more evident was the influence of Cleopatra and Egypt upon his mind. Like Alexander before him, his head seems to have been turned by the king-god tradition, assisted no doubt in his case by the adulation of that charming hereditary goddess, Cleopatra, We find evidence of exactly that same conflict upon the score of divine pretensions, between him and his personal friends, that we have already recorded in the case of Alexander. So far as the Hellenized east was concerned, the paying of divine honours to rulers was a familiar idea; but it was still repulsive to the lingering Aryanism of Rome. Antony, who had been his second in command at Pharsalos, was one of the chief of his flatterers. Plutarch describes a scene at the public games in which Antony tried to force a crown upon Caesar, which Caesar, after a little coyness and in face of the manifested displeasure of the crowd, refused. But he had adopted the ivory sceptre and throne, which were the traditional insignia of the ancient kings of Rome. His image was carried amidst that of the gods in the opening pompa of the arena, and his statue was set up in a temple with an inscription, «To the Unconquerable God!» Priests even were appointed for his godhead. These things are not the symptoms of great-mindedness, but of a common man’s megalomania. Caesar’s record of vulgar scheming for the tawdriest mockeries of personal worship is a silly and shameful record; it is incompatible with the idea that he was a wise and wonderful superman setting the world to rights. Finally (44 B.C.) he was assassinated by a group of his own friends and supporters, to whom these divine aspirations had become intolerable. He was beset in the Senate, and stabbed in three and twenty places, dying at the foot of the statue of his fallen rival Pompey the Great. The scene marks the complete demoralization of the old Roman governing body. Brutus, the ringleader of the murderers, would have addressed the senators, but, confronted by this crisis, they were scuttling off in every direction. For the best part of a day Rome did not know what to make of this event; the murderers marched about with their bloody weapons through an undecided city, with no one gainsaying them and only a few joining them; then public opinion turned against them, some of their houses were attacked, and they had to hide and fly for their lives.